When it made its first appearance in 1849, the $1 gold coin was a mere 13 millimeters in diameter—more than one-fourth smaller than our present-day Roosevelt dime. That made it the smallest coin in U.S. history in girth, though not in weight (the silver three-cent piece weighed less). Many Americans grumbled that because it was so tiny, they had trouble keeping track of it. And losing a dollar was no small matter back in the mid-19th century; for many, it represented a day’s pay. In 1854, the Mint took steps to remedy the problem; Without changing the gold dollar’s weight, it increased the coin’s diameter to 15 millimeters. This yielded a coin that was noticeably larger, considerably thinner—and presumably less likely to get lost. But the new Type 2 dollar had a serious deficiency of its own: Its designer, Chief Engraver James Barton Longacre, had made the relief too high on the obverse. As a consequence, very few examples were fully struck—and virtually all the coins wore down quickly in circulation, deteriorating rapidly into all-but-dateless disks with fading features. So it was that in 1856, Longacre had to try again. Returning to the drawing board, he applied the same principle to the obverse design as the Mint had applied two years earlier to the physical dimensions of the coin: He made the portrait larger but also flatter. Besides enlarging the portrait’s size and reducing its three-dimensional depth, Longacre also moved the inscription UNITED STATES OF AMERICA closer to the border on the obverse, where it encircles the “Indian Head”. On Type 2 coins, it had been directly opposite the wreath on the reverse, and this had made it harder to strike both sides with sharp details. Wreaths appear on all three gold dollar types. On Type 1 examples, however, the wreath is smaller and UNITED STATES OF AMERICA encircles it. By moving the motto to the obverse, Longacre was able to make the subsequent wreaths larger and more intricate; they represent bundles of corn, cotton, wheat and tobacco. He also moved the number “1” entirely inside the wreaths on Type 2 and Type 3 varieties; on Type 1 specimens, it appears at the top of the wreath. All three types carry the inscription 1 DOLLAR plus the date on the reverse. Mintages were highest in the early years, partly because worn-out or uncurrent gold coins were being recoined during that time. 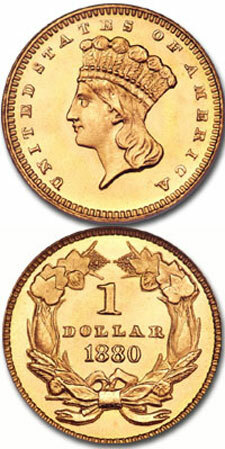 In 1861 and 1862, for example, large numbers of Type 1 gold dollars hit the melting pot for recoinage. Side-by-side circulation of these smaller dollar coins with the later, larger ones had been causing confusion, so Mint Director James Ross Snowden had ordered that the smaller coins be set aside and held at the New York Subtreasury. The accumulation totaled some 8 million pieces before recoinage. Only twice, in 1856 and 1862, did production exceed a million in a single year—both times at the main mint in Philadelphia. In the early years, the Charlotte and Dahlonega mints turned out gold dollars on a regular basis, but those Southern branches were closed in 1861, following the outbreak of the War between the States—and after that the coins were struck almost exclusively in Philadelphia, the only exception being the San Francisco issue of 1870. After 1862, mintages seldom topped 10,000. The low point came in 1875, when just 400 business strikes and 20 proofs were made. Other rarities are the 1856-D, with a mintage of 1,460, and the 1860-D, with 1,566. The Confederacy struck an unknown amount of 1861-D gold dollars; reportedly, only a handful survive. Proofs were made every year and with the exception of the years 1882 through 1889, all had low mintages and are quite rare. Type 3 gold dollars are far more plentiful in choice mint condition than the two earlier types, and the key points of reference for detecting signs of wear—the cheek and the bow-knot on the wreath—are more likely to be pristine. Gem examples of 1862, 1874, and many dates in the 80s are generally available. Although a complete date and mintmark collection of Type Threes in mint state is not impossible, the pre Civil War mintmarked coins will stop most collectors without lots of time and even more money. Alternatively, a large number of the low mintage coins made from 1879 through 1889 were saved in superb condition, and many collectors assemble them into beautiful 11 piece short sets.